2015-11-25 by Alessandro Pasotti filed under GIS, Python, QGIS, Varie. 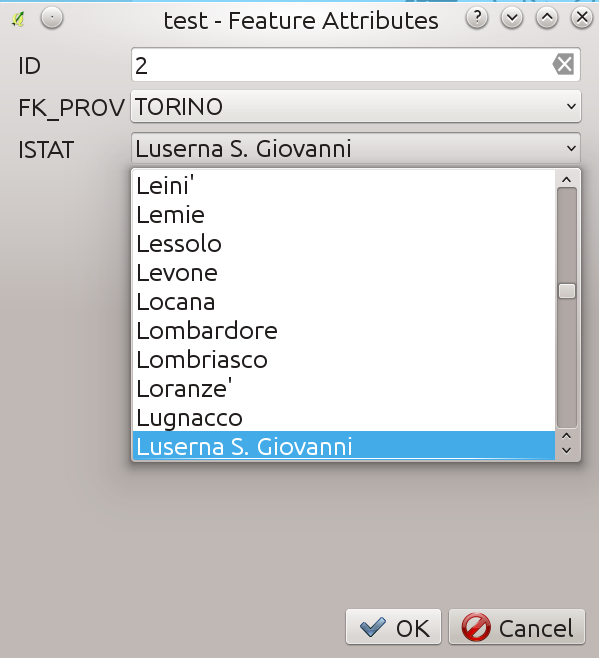 Still hot from our forge: a new QGIS plugin allows dynamic filtering of items in combo boxes in attribute forms. This plugin has been partially funded (50%) by ARPA Piemonte. This is a core-enhancement QGIS plugin that makes the implementation of complex dynamic filters in QGIS attribute forms an easy task. For example, this widget can be used to implement drill-down forms, where the values available in one field depend on the values of other fields. This function returns the current value of a field in the editor form. If the field does not exists the function returns an empty string. Download the example project. This is the new widget in action: changing the field FK_PROV, the ISTAT values are filtered according to the filter expression. It’s exactly what I need but i do not manage to use it. Would it be possible to describe the layer that you are working with and the field of this layers ? With that I would be able to adapt it to my needs. Just added an example project, hope that helps. That’s perfect, I get it working with what I wanted to do. can I use this plugin together with a Qt Designer form? No: a QT designer form uses its own widgets. Looks like a nice addition! I will test in more detail later. I though on mentioning that when I did a quick test, the ui in the Edit Widget Properties did not load properly while having a locale language for QGIS (Finnish). This works fine except when we use a subform (relation 1-n of a database).